The Ben Utter Trail to Step Stone Fall’s has to be one of our top ten favorite hikes and we’ve done a lot of hiking from Washington down to California. This isn’t on our list of challenging hikes as it’s mostly flat terrain, well marked trails and a short distance of three miles. But what it lacks in challenge, it makes up for in scenery with its luscious greenery, pretty foot bridges and lots of water. 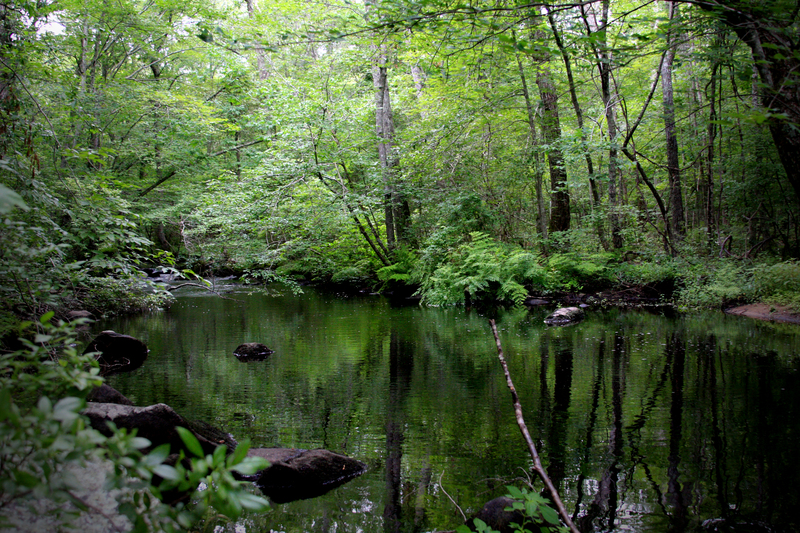 It’s the perfect summer leisure hike for a fun day date, and from what we’ve heard, is worth the visit during spring and fall as well. One disclaimer we will say is that it is very hard to find. Yelp is our usual source of information and recommendations, however Yelp’s address was completely off this time. It led us to an empty field featuring no waterfalls nor trails. We found another website that led us to Purgatory Road half a mile down Ten Rod Road to a golf resort. We should have known anything with purgatory in the name probably isn’t a good thing. Finally, after using Google Map’s satellite view and notes from other lost travelers, we found our destination. Think of it as a fun treasure hunt, because trust me, the trail from the get go was worth the 30 minute detour of being lost. We’re going to make this very easy for you and compile everything we learned right here. Here’s the address: Plain Rd, Exeter, RI 02822. We came in from Escoheag Hill Road as there were some easy landmarks to follow. If you’re coming from that side, look for a red log cabin and take a turn onto that dirt road. The dirt road’s name in Plain Road and it’s well kept (we made it with a small sedan, therefore no one has a reason to not visit!). 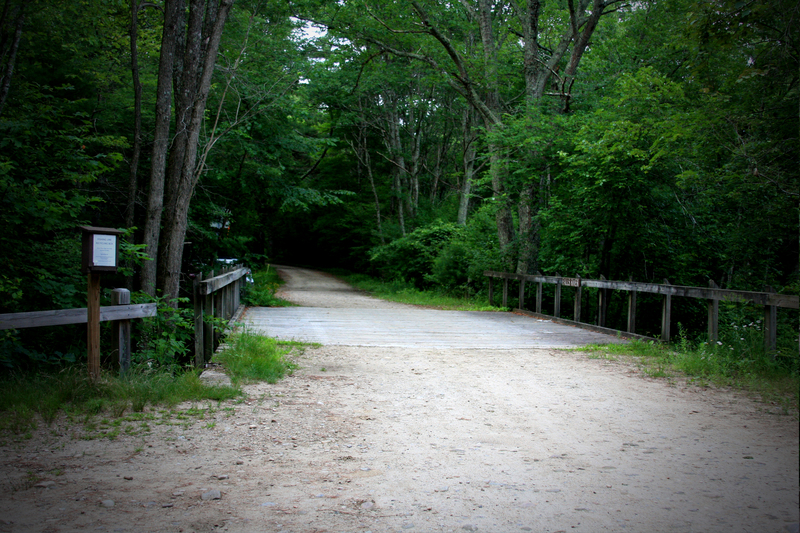 You’ll travel on this road for about half a mile, crossing a tiny bridge to eventually arrive at a larger bridge. This larger bridge will have 4 ton weight limit sign and you’ll see a sign on the actual bridge that says “Falls River”, which is actually called Wood River on the map (very confusing). There’s parking to the left before you get on the bridge and after the bridge. Before you cross the bridge on the left side, you’ll see a tiny sign for the Ben Utter Trail. 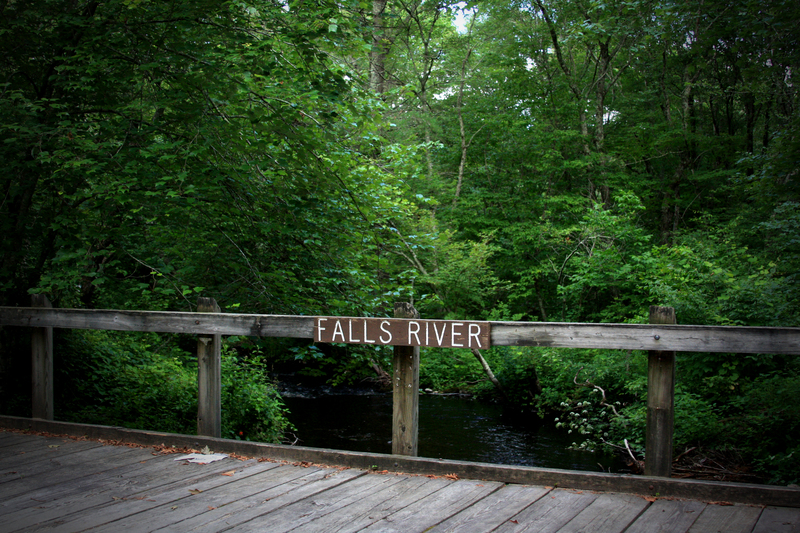 Once you get onto the trail, the hike follows the river all the way to the final destination of Stepstone Falls. 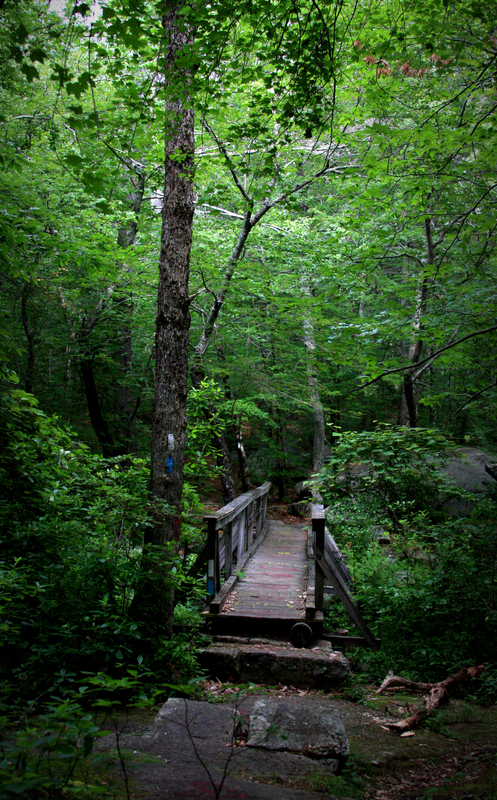 You’ll want to follow the blue markers painted on the trees until you come to the waterfalls. We hiked the Ben Utter Trail at a leisurely pace, stopping at all of the small trail outlets (like the image above) along the river to take in the view and snap some photos. This would be a good date to bring lunch with you and we recommend our tortilla chicken wraps recipe or something that is packable and easy to serve. We found a large cluster of boulders that overlooked the Falls River after crossing the larger footbridge towards the end of the hike and enjoyed lunch there. Don’t stop the hike there though! Once you cross the bridge, take a left and follow the river a few yards. 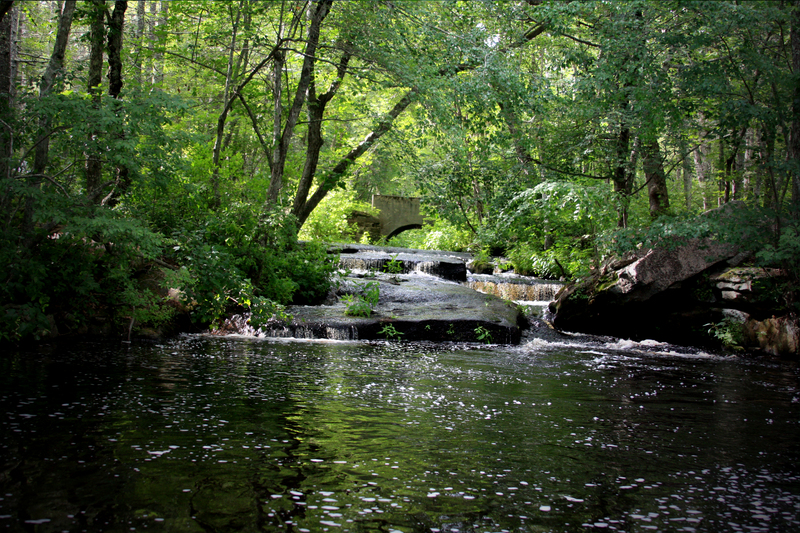 You’ll find your final destination of Stepstone Falls where old quarried granite slabs are scattered around to the right of you and waterfalls are to the left. We spent a good half hour exploring and enjoying the scenery, before heading back and calling it a successful day. Quick public service announcement, bring bug repellant when it is humid out as there will be mosquitoes. 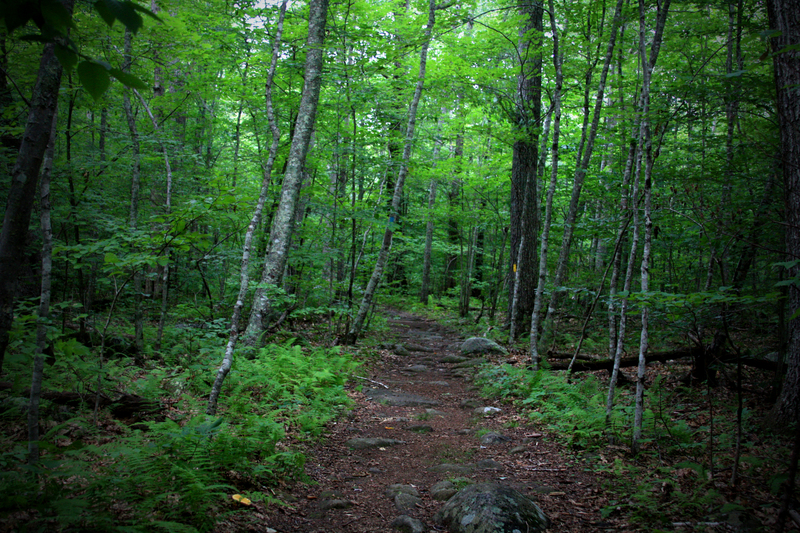 This hike is great for everyone but please protect yourself so you can keep reading our blog. This has been on my list for awhile now. This summer or fall might be the time! Thanks for making it much easier to find. We saw photos of this hike in the fall and we definitely want to go back and see all of the foliage. Glad we could help make it a little more easier to find. It’s truly a needle in the haystack! Read your post and checked this place out. My boyfriend and I totally loved it!!! We also struggled a bit to find the trail head though your directions were very helpful, however it is 4 ton weight limit on the bridge not 5. We drove over it in search of a 5 ton bridge before realizing we had gone too far. LOL. Thank you so much for such a great date suggestion!!! Great scenery. I love the beauty & the beast but I love the beauty more. Don’t get me wrong, please. I mean I love the beautiful scenery more than the hike :). Hahaha yes, the scenery certainly makes the hike worth it.